Danny is upset that Max isn't happy about him winning the diving trophy. Maria tells Max that the boys are growing up and he has to let go. 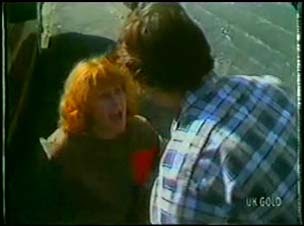 Danny stops Carol Brown's little girl running into the road. Her mother isn't pleased. Paul find Mrs Brown unconscious. Paul runs in to get Helen. She gets Jim and Max. Max and Jim have lifted Carol off the floor - she's dead drunk. Helen says that she's take the kids over to their place to look after them. Maria tells Danny that she's proud of him for winning the trophy. Danny says he only did it to show Max that he could do it. Maria asks Danny not to sell Max short. Danny tells Maria to find him some proof that Max is at all interested in him - Shane is his golden boy, not Danny. MARIA: I want to stop what's happening in this family. DANNY: Then stop sitting on the fence, Mum. Danny says that sooner or later Maria will have to make up her mind who's side she's on. Scott is playing what looks like Swingball, but it is tied to a washing line! He and Danny head off. He tells Danny that he's seen some jobs going at a supermarket, so they go to have a look. Scott tells DAnny about the situation with Mrs Brown. Jim is trying to find a phone number for Ted Brown in the Yellow Pages. Jim says she doesn't understand why it's their responsibility. Helen is surprised that Jim has become so cold. Julie is moaning about Mrs Brown's kids staying with them. Helen says you can't just ignore people with problems. Paul is on the phone leaving a message for Father Barry. He says the Daphne is helping out. Julie surprised that Daphne is so involved. Julie asks Paul if he thinks there's anything going on between Des and Daphne. Paul says Julie should ask them. He mocks Julie about asking Des for a lift to work. He says Julie should play it straight with guys. Daphne is dressed up in a riding outfit ready for work. Des is quite appreciative(!) Des is looking through his little black book for potential dates. Suddenly he decides to ring a girl called Rita. A man answers the phone. It turns out that Rita is married. Des hangs up quickly. Lucy is fed up of playing with the Brown children. She tries to ask Jim a question about school but he won't listen. LUCY: It's OK, Gran. Julie told me about Dad's mid-life crisis. Just then the door-bell rings and Helen answers it to Mrs Brown - she's come to pick up her children. Helen asks her how she is. She says she's angry because people have barged into her house and taken her children. Helen points out that they were only trying to help, considering the condition Mrs Brown was in. Mrs Brown says she was just having a dizzy spell(!) and Helen's lucky she didn't call the police! Paul answers the door to Father Barry. He shows him into his and Scott's room. In the kitchen, Lucy is grilling Helen on what's wrong with Mrs Brown. HELEN: She apparently has dizzy spells. LUCY: Then why did Paul say to Julie she was "smashed"?! Helen says that Lucy isn't to repeat that to anyone. They go on to talk about what Lucy wanted to talk to Jim about. Lucy says it doesn't matter. Paul tells Father Barry about Mrs Brown and her alcoholism. Father Barry has been visiting Mrs Brown recently so he is concerned. He tells Paul that things are heavy round at Mrs Brown's. He says he'd better get round there. Paul says to let him know if he can do anything. Father Barry has called around to see Carol. He asks her sharply if there is alcohol in the house. She insists she hasn't touched a drop. Father Barry says that for the sake of her children she has to do something - and her husband is worried about the children. Mrs Brown continues to insist that it was a dizzy spell. Daphne comes in and throws her cowboy outfit on a chair. Just then there's a knock at the door. It's Julie, much to Daphne's surprise. To her even greater surprise, she invites Daphne to come and play tennis at her club. She says that Daphne and Des could play mixed doubles. Daphne says that she can't speak for Des because they lead separate lives. Julie looks very pleased at this. Daphne says that she and Des are just friends. Helen is asking Lucy about the problem at school again and Lucy says it's fine. Helen explains that Jim has been working very hard recently, but that's no reason for the family to stop talking to each other. Lucy says wisely that some things you just have to work out on your own! Scott runs in in a panic and says that Jim has to talk to Max - he won't believe that Danny was working at the supermarket last night. Jim says he's not butting in on the Ramsay family. Scott isn't pleased. When Scott has stormed out, Helen says that it's about time Jim starts communicating with his kids again - they don't have a father or a mother at the moment. Jim says he can't help the way he feels. Helen tells him to stop feeling sorry for himself. Jim says that some things you need to work out on your own. Danny is looking at his speakers in the window. Just then they see Mrs Brown staggering past unsteadily. Mrs Brown is mugged. Danny sees her on the floor and races over to help. She starts screaming that Danny is mugging her. He and Scott panic and run.